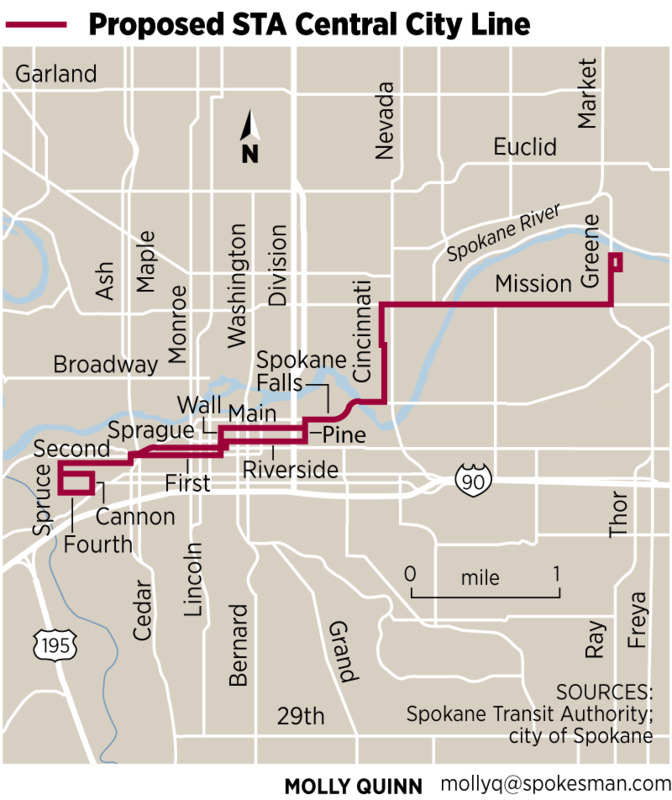 Thu., April 21, 2016, 4:19 p.m.
Spokane-area voters will be asked for a second time to fund a major expansion of transit service, including a new Central City Line, after an initial measure was rejected last April. On Thursday, the Spokane Transit Authority board voted to place a renewed transit proposal before voters in November. The board voted 6-3 in favor of the request. The measure calls for a 0.1 percent sales tax increase in April 2017 and a second 0.1 percent sales tax increase in April 2019, with both taxes running through 2028. Last April, voters narrowly rejected a similar measure that would have raised the tax by 0.3 percent for 10 years. STA officials said the requested tax increase was smaller because an improving economy appears poised to raise money at a faster rate in coming years. Board members who voted in favor were County Commissioner Al French; Spokane City Council members Amber Waldref and Candace Mumm; Cheney Mayor Tom Trulove; Airway Heights City Councilwoman Aspen Monteleone; and Liberty Lake Councilman Keith Kopelson. Voting no were County Commissioner Shelly O’Quinn and Spokane Valley City Council members Chuck Hafner and Ed Pace. In addition to building a Central City Line running from Browne’s Addition to Spokane Community College, the measure would improve the convenience and frequency of bus and paratransit service across the STA’s public transit area, which encompasses Spokane County’s urban areas. The measure specifically calls for the earliest possible work to increase night and weekend bus service; construct a new West Plains transit center along Interstate 90; and increase service to Spokane Valley medical facilities. New transit centers and improved routes are also in the plan, with the aim of enhancing service in every neighborhood in the transit service area. The plan also anticipates a need for bus replacements in coming years. Proponents said putting the measure before voters in November will give the greatest number of voters a chance to voice their wishes on transit expansion since presidential elections attract the greatest turnouts. In addition, including a sunset clause for the end of 2028 provides the same electorate a chance to decide if they want to extend the taxes. That is also a presidential year. The cost of the project to local taxpayers is estimated at $192 million, which includes construction, new buses, other equipment and operating costs. The sales tax would raise just over $210 million. The local investment would be enhanced by $85 million in state and federal grants, with $72 million of that amount going to a Central City Line. The grants would pay the cost of building the Central City Line, with local funds used to operate it at about $4 million a year. STA board and staff members said the line is best described as an electric bus rapid transit system, not a trolley. Sleek rubber-tire cars would run on a fixed route with enhanced stations and other streetside amenities. The vehicles would be recharged quickly while in service. Passengers would pre-purchase their passes or tickets to speed boarding. The board on Thursday debated several financing scenarios before settling on a preferred one. Mumm said the option that was selected will ensure that the projects stay on schedule. She pointed out that the STA board can always reduce the tax later if it ends up with extra revenue. French said the plan should bring in enough money to protect against an economic downturn. In a news release, he called it an important economic driver for the community. O’Quinn said she voted no because she was not convinced the STA board had done enough financial analysis on the tax proposal. “The difficulty in the dialog is about the amount,” she said. O’Quinn lost on a motion to postpone a vote on the tax plan until May. She also lost in an effort to delay a second 0.1 percent sales tax until 2022 instead of 2019. Also on Thursday, the board approved a preferred route for the Central City Line, including portions on Sprague and First avenues; Riverside and Main avenues; and Mission Avenue. Published: April 21, 2016, 4:19 p.m.